German tuner G-Power will upgrade your BMW X5 M into a Lamborghini Urus fighter. There’s been a lot of talk lately about the Lamborghini Urus becoming the world’s first Super SUV. Thanks to its Audi-sourced 4.0 liter twin-turbo V8 producing 650 hp, the Urus is officially the fastest production SUV ever made with a 0-62 mph time of 3.6 seconds and a top speed of 191 mph. There are other alternatives in the aftermarket tuning world, however. If you’re looking to modify the already potent BMW X5 M, there are plenty of options available. Since it first launched in 2014, the high-performance SUV is starting to get outclassed by the competition, so German tuner G-Power has updated it with new tuning packages offering a range of power enhancements. 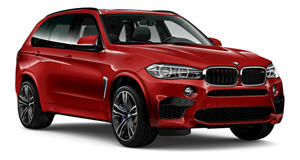 Powered by a 4.4 liter twin-turbocharged V8, a stock BMW X5 M delivers an impressive 575 hp and 553 lb-ft of torque allowing it to do 0-62 mph in 4.2 seconds and reach a top speed of 155 mph. Opting for G-Power’s Stage 1 kit raises the X5 M’s output to 650 hp and 627 lb-ft of torque to match the Lamborghini Urus by using either the tuner’s Bi-Tronik 2 V1 engine software optimization or an external Bi-Tronik 5 V1 power module. The stage two upgrade boosts the twin-turbo V8’s power to 700 hp and 667 lb-ft of torque. To achieve this, G-Power installs a new set of downpipes next to one of the two electronic power enhancements to reduce the back pressure in the exhaust system. If you want the best possible performance, the highest configuration stage transforms the BMW X5 M into a mighty 750-hp monster with 722 lb-ft of torque. This configuration adds a new G-Power titanium exhaust system with four 100-mm carbon tailpipes, delivering a 23-kg weight advantage over the SUV’s standard exhaust system. The turbocharger has also been tweaked to round off the hardware modifications. In addition, G-Power offers a widebody kit that gives the X5 M a more muscular look thanks to new fenders, front and rear spoilers, and a carbon Venturi hood for extroverted drivers. G-Power hasn't detailed how these modifications affect the performance, so we’d love to see this modified BMW X5 M battle it out with the Lamborghini Urus.